I am not even going to get into how many purses that I actually have, but I will admit that I recently got mad at myself when I found a whole container of them under the bed! I am however, trying to declutter and have sold several and my recent Yard Sales so eventually, I’d like to get it down to about 2 dozen! Shoot, I still remember back in the 80’s when I ‘had’ to have a purse to match every pair of shoes to match every outfit – crazy right? What is your accessory obsession or do you even have one? If you remember this dress, it was for a sponsored post for Midnight Velvet and I love their Google+ page. They are always having contests and giveaways, so check them out when you get a chance. 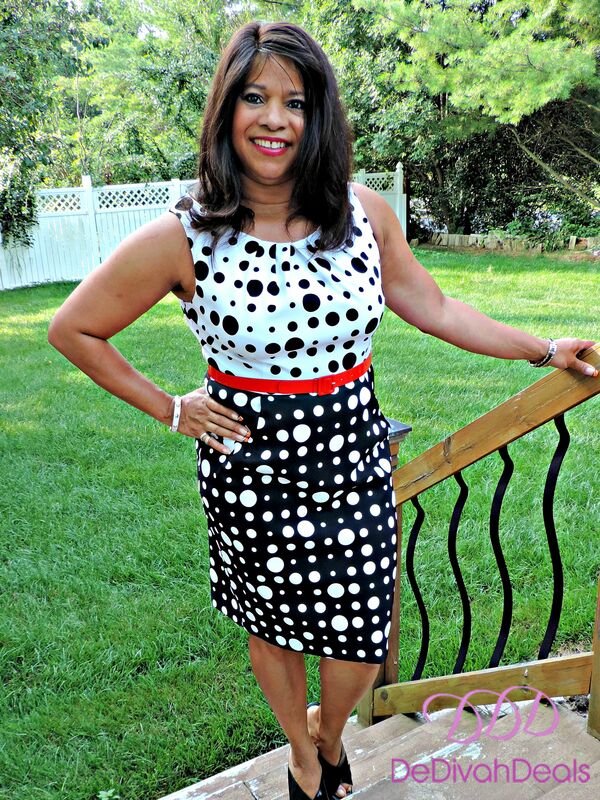 I am glad that I chose this dress to feature because not only are Polka Dots prints my favorite but also because it can be worn all four seasons. I’ve worn it with a cardigan sweater in Autumn and with a blazer in the Winter. Also, it has side pockets, not that I use them to store anything, but I do like that it’s not just an “A line” dress, like the other sheath dresses that I have. I found this clutch in the back of my closet and remember that it was thrifted from Goodwill last year. I thought it might pair well if I were going out to dinner or to church, but the red tote is much more practical for wearing to work. The neckline on this dress is very flattering and I don’t usually like skinny belts but I do like how this one fits on me! 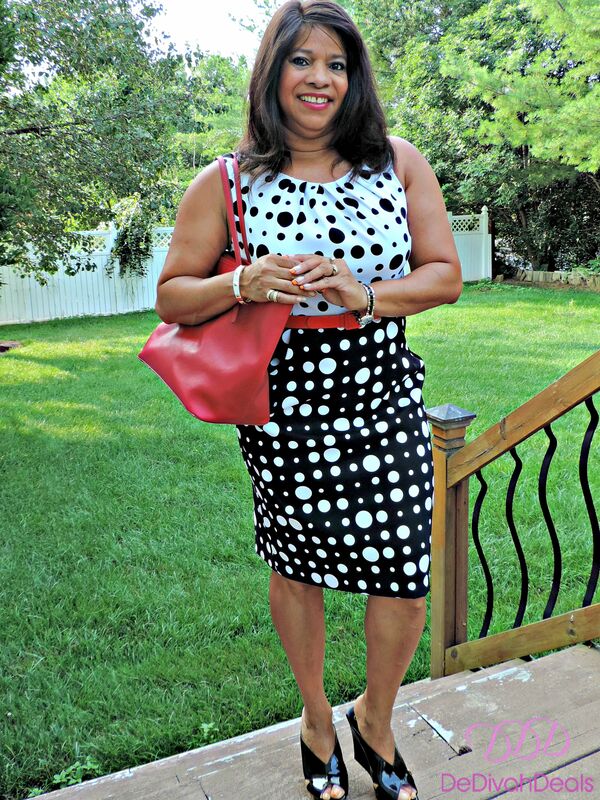 This red tote was purchased from Walmart but I have a few others in similar styles from Avon. Love love love these Jessica Simpson sandals!! 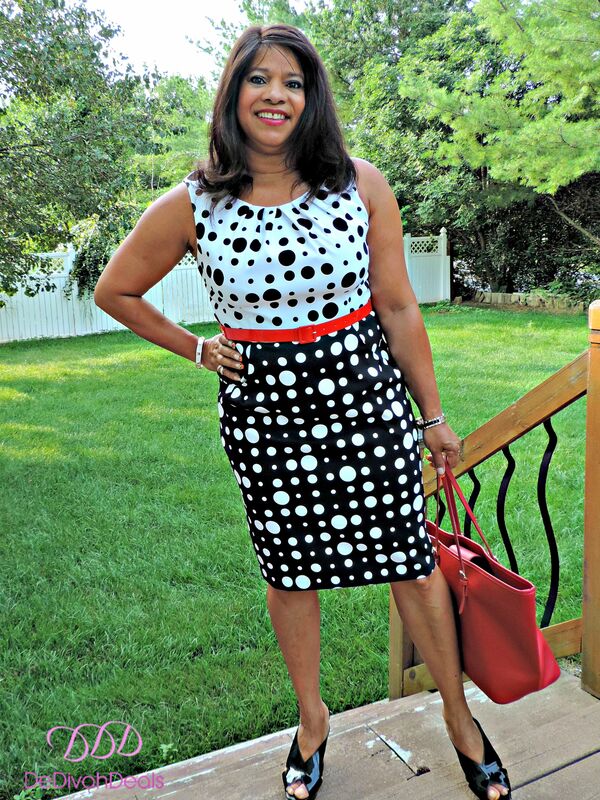 Okay, so which purse would you pick to wear with this dress? The solid red one. Try using your camera with a tripod and a timer to do shots. Thank you, yes, I am using the timer and tripod, it’s just taking me longer to change shoes because I don’t have him standing there giving me the side eye! I like the solid red one too, the other purse is too fancy for work in my opinion. Yes, and I can carry a whole lot more! thank you, I forgot that is also has a strap, I should have shown it that way as well. I love them both, but the tote is my fave! Sending best wishes for your husband too. Thank you Elsie, I also have it in Peach/Pink, check out next week’s pics. Thank you Elsie, it holds more junk too!